If you understand how fire alarm systems work, you’ll understand why you need one. The simple truth is they save lives. The main purpose of a fire alarm system is to inform all humans in a building that there is a fire. Once you are warned, you can evacuate the building and wait for call the fire department. The fire alarm system consists of fire sensors. They are waterflow, pull station, smoke and heat detectors. These are located throughout the building. They are connected to a main alarm panel. This panel is connected to loud speakers or horns that produce a loud alarm throughout the building and the surrounding areas. Fire alarm systems are required only in specific types of important and public buildings by Code. However, it is wise to provide it for people who work in these environments. Smoke detectors are used to sense smoke. Heat detectors detect sudden increase in heat. Some systems provide a manual pull station call point button that is placed near exists that can be pulled pressed by anyone who realizes there is a fire. There is also a strobe on the outside of the building. It has a response indicator (small red light) that is placed outside a door. This lights up if the smoke detector It’s connected to the fire alarm, signaling that the fire alarm has been activated and helps firefighters locate the building.here is an active fire. 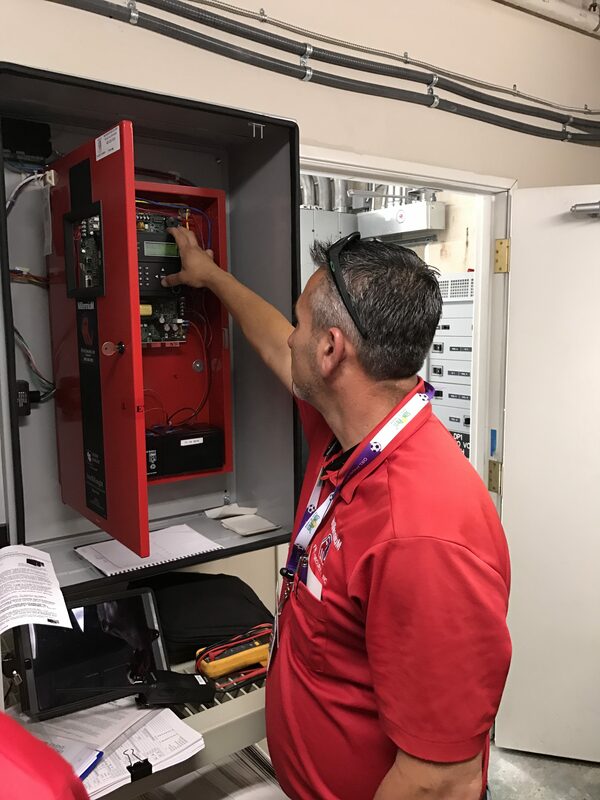 At Millennium Fire & Security, we pride ourselves in serving the community with alarm systems that save lives. Our fire alarm systems are second to none. We offer alarm systems for small and large businesses. Our systems meet or exceed NFPA state and local codes. We have 20 years of experience and training in the National Fire Prevention Association codes and standards. Whatever your needs, call us today. We service most all brands of fire alarms and we install both addressable and conventional systems. We have programs and price ranges for just about everyone.